Change is intimidating for just about every member of every organization, from the top right on down to the newest, fresh-out-of-college hire. One of the main reasons change freaks us out is that humans tend to adapt to our environment. So even if we don’t like the status quo, we’ve figured out ways to work around it and survive. Change brings with it the unknown, and the threat that we’ll have to rebuild all of our survival mechanisms in the new environment. Knowing how threatening change can feel, what’s a good leader to do to make change go more smoothly for their team? In my work with organizations, I’ve heard a lot of companies make the assumption “we’ll tell the rest of the employees more about this change once we know more.” But there’s always *more* information to be gathered, and announcements about change can get pushed back and pushed back until the very last minute. I’ve even spoken to some companies where they delayed in making the official announcement for so long that employees accidentally found out about an upcoming change from someone outside the company! There are obvious reasons not to announce a change when there’s no other information to share, but employees across industries report that they would prefer to be notified of impending changes – and even possible changes – sooner rather than later. Early inclusion of employees is a way to show appreciation, but it’s not just good practice from a retention standpoint. When a company seeks input from workers across all levels, they’re more likely to identify potential issues. Susan in Purchasing may not be high on the food chain, but she may know a small but significant detail that leadership doesn’t know, that might derail your big plans! With everyone involved, you can better predict potential problems. Now your job is to tell your team not just that explanation, but take it a step further. Why is this change not just good for the company, but also good for them? What opportunities might come from this change? Will it eliminate a cumbersome reporting process? Will it mean new hires to help spread the workload around? Will it mean chances for promotions and raises? Show them how this change will benefit not just the company, but them individually, and it will make the stress of change a lot easier to swallow. A longitudinal study on change showed that employees were happier about change when they felt more engaged in the workplace. An upcoming change is a perfect time to make sure the lines of communication are fully open among your team. For maximum engagement, employees should communicate now just upward, to you, but also among one another. This is the perfect time to make sure your team meetings are interactive and participatory (and not just one boring report after another). Another strategy to consider is activities that build teamwork, like an off-site volunteer service afternoon. The more your team communicates and feels cohesive, the more smoothly the change will go. Help your team manage the uncertainty of change by sharing benchmarks with them, even if they benchmarks don’t directly impact them. Tell them “The initial review team has completed X, and now the plan is moving to the Z Department. If everything goes according to plan, we’ll be moving on to Phase C, and I expect our team to start doing Y within the next 2 weeks.” Feeling in the loop, especially about how long things are expected to take, will keep your team motivated. As the change seems to come to a close, it’s great to acknowledge everyone’s contributions. But in order to make that acknowledgement meaningful, you need to really know how your team likes to be thanked. I’ll never forget the time I was sitting at a table after delivering a keynote speech: most of the table around me was leadership, with a few less-senior employees. The exercise was to talk about ways to thank employees, and the leaders were excitedly dreaming up lots of big thank-you’s on the company Intranet, parties, etc… the employees at the table were silent. Finally, one spoke up. “Um… most of us would feel embarrassed to be thanked so publicly. We don’t really want cake or anything. 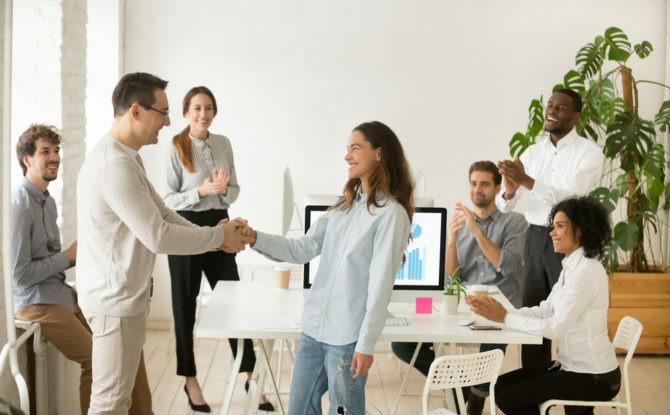 Maybe just a note from my boss?” It was a big wake-up call to leaders that what matters is how the employees want to be thanked, not how you think they want to be thanked. To make your employee appreciation meaningful, be sure it’s a thank-you they’ll appreciate. Leading through change is tough. There will be confusion, frustration, and probably even a little fear. But if you can give your team these 5 things to help them navigate change, your team will be stronger and better on the other side.